Client Hville FCP Pty Ltd. The proposed development is located at 93 Forest Road, Hurstville set within the Hurstville City Centre. It is bounded by Durham Street to the north, by the Illawarra Railway Line to the south, by Kempt Field to the east, and by the Stage 2 East Quarter site to the west. The site is conveniently positioned within walking distance to Hurstville Railway Station and Allawah Railway Station. 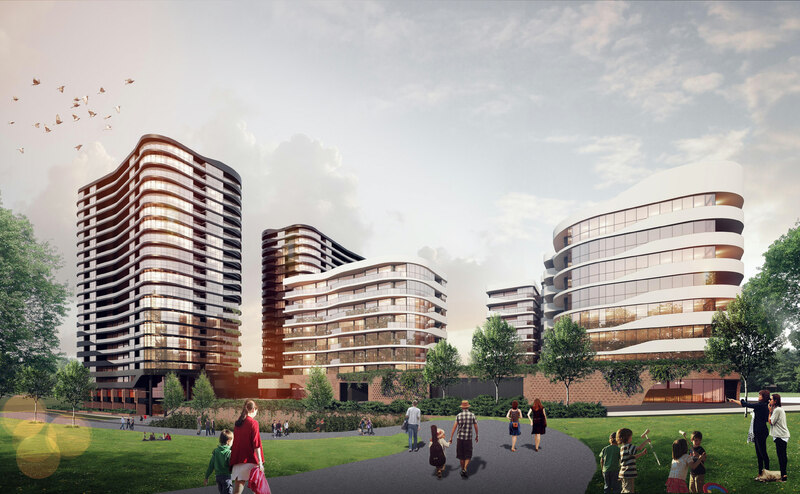 This development will provide a high-quality mixed use development that respects its setting and sets a new benchmark for design excellence in Hurstville. The proposal includes basement parking, retail shops, a supermarket, two podiums and four buildings ranging from 7 to 18 storeys for 556 residential units. Coordination of the consultancy team for the Development Application. Image courtesy of DKO Architects.